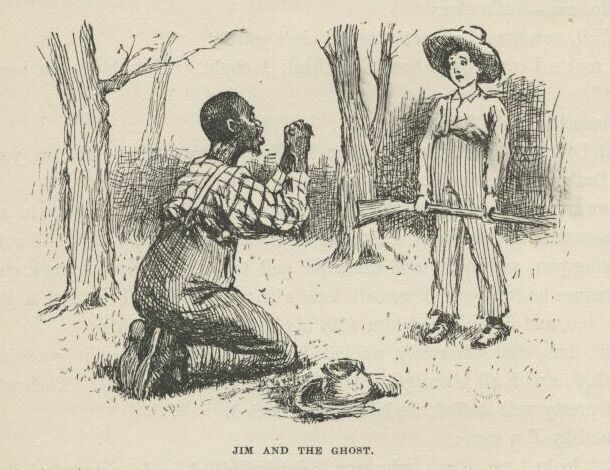 “Jim and the Ghost” from ‘Adventures of Huckleberry Finn’ (public domain image from Wikipedia). She wonders what the flaw was in Slaughterhouse Five or Little Women that Huckleberry Finn didn’t also contain. And her comments coincide with a furore over a new edition of Huckleberry Finn in which the publishers have decided that Twain’s many hundreds of uses of ‘the N word’ are too hot to print in the modern market. So they’re taking them out, replacing it with ‘Slave’ and deleting all uses of the term ‘Injun’ as well. Language is important, and in the same way that we try to be deliberately inclusive in the feminist arena by rejecting language which is sexist, ableist or casually tolerant of any kind of bigotry, seeing prejudices treated as acceptable on a page can influence people. This isn’t the first time the work has been censored – CBS made a tv version in 1955 which cut out all mention of slavery and cast a white actor as Jim. Niiiice try, but no. I’m with Emma on this though: if you’re too young to realise that Huck (or Tom Sawyer) parroting the local prejudices was done deliberately to reflect badly on the society they were in, and their poor and uneducated backgrounds, then the story itself should be enough to demonstrate the inhumanity of racism. …which isn’t to say that Twain doesn’t also play unacceptably on stereotypes of coloured people in the book for what seems like cheap comedy value at times, because he certainly does. I think there’s a bigger opportunity here. Those three books most assuredly don’t speak to “every reader and condition” – so let’s find some that do! Your suggestions please, for books which spoke to you directly, which touched your heart, or which you think have genuine near-universal appeal. Let’s make a new top three: the authors can be any nationality, the books originally in any language. Answers in the comment thread, go! Any of the H*rry P*tter books. Much as I find them derivative, they touch on all the universal themes. When I moved to China ten years ago, the first thing my students asked me was how to pronounce ‘Quidditch’ correctly. Says it all really. I’d put To Kill a Mockingbird above any of the three they quoted, definitely! Mm. Well, Huck Finn and TKaMockingbird are both novels which have the black people saved by the heroic white guy though, aren’t they? I know a lot of Americans resent their status as the ‘definitive novels on race and racism’ in the curriculum for this reason. Also STEVE STEVE HAVE YOU READ THE HUNGER GAMES YET, STEVE. On that issue, Roll of Thunder, Hear My Cry by Mildred D Taylor is really, really good. Affected me hugely when I read it in my school library aged about 12. There is definitely no saving involved. Also Giovanni’s Room (1956) by James Baldwin for a complex, harrowing portrayal of a gay relationship (note: there’s misogyny, but not so much on the part of Baldwin as his characters, who are battling repression, using their relationships with women as a “front” for their actual desires, and so on). It’s heavy going, though. a confederacy of dunces, by john kennedy toole. in watermelon sugar, by richard brautigan. Book of Franza by Ingeborg Bachmann. Most influential books to me so far, particularly the first. I can’t attest to their universality, but I personally think laying claim to that idea is silly anyway. Vonnegut’s ‘Mother Night’, or Faulkner’s ‘As I Lay Dying’? Futures trading, market forces, the insanity of those and of war. world literature. Good shout for As I Lay Dying though. With the original top three, laying aside The Universality Debate for a moment, I’m just not sure why this critic thinks there are only three Great American Novels in the first place. Just on the predominantly white and male “trad canon” writers front, there’s John Dos Passos, John Steinbeck, late-period Henry James, Saul Bellow, and Hemingway? So yes, the original premise is flawed in the first place. But I have to admit I’m not a big reader of any of the authors above. Louisa May Alcott actually had a really big effect on me when I was younger, and I’d agree with Cat Valente that Little Women has far more to it than its detractors often claim. In fact I’d defend Little Women quite extensively if given the opportunity. Maybe I should write a post. Sorry – top 3 books I meant. I think the premise of the statement is deeply flawed, due to the huge variety of human experience how can any book really expect to have universal appeal? The three mentioned clearly fall down on gender, class and racial lines, but surely we’d also need to consider sexuality and cultural aspects too to find a universal novel. I just don’t see it happening. Having said that, I’d bring up a book I read recently called Cloud Atlas by David Mitchell (no, not that David Mitchell). It’s soft sci-fi with 6 stories set in different times, some past, some future. I’d say it takes a pretty good shot at looking at life from the perspective of a whole massive different set of identities. Plus it’s really good, just in general. felt that WOT treats women sensibly, cleverly, and fairly. I recognize that books that speak to me aren’t going to have universal appeal. ;-) Here are three off the top of my head. 1. V for Vendetta by Alan Moore. I can’t adequately describe how much this book has affected my thinking since I first read it in 1988. 2. Cat’s Cradle by Kurt Vonnegut. This started my quest to read all of his books. I adore it and find new stuff to think about every time I read it. Alice’s Adventures in Wonderland. The arbitrariness and madness of the adult world, viewed by the child who still lurks (I hope) somewhere inside everybody. I think there’s something here for anybody who hasn’t died from the inside. The Wind in the Willows. Not the Toad chapters, but (especially) “Dolce Domum”, which says what there is to say about home; “The Piper at the Gates of Dawn”, which is simply wonderful; and “Wayfarers All”, which says what there is to say about the urge to leave home. I also love the seasonality of the book… spring, summer, autumn, winter are all encapsulated — and something important evoked about each of them. The Edible Woman – Margaret Atwood: because I really relate to this novel, and how the main character struggles to keep hold of her identity while the men around her try to swallow her up.